I am currently trying out for a TopStepTrader account and recently opened a OneUp Trader account, as well. I was also taking all the same trades in my live account with only a single contract: however, I recently placed a pause on attempting to match in the live account because I am experimenting with some new techniques and seen no reason to risk triple jeopardy losses. This is my first “combine” at TopStepTrader. Even though, I have taken a few hits recently, my ability to read the markets is still strong. On most of my losing trades, they would have worked out with only an 8 tick stop loss. I might could have already passed the TST combine if I loosened up my risk. However, one of my goals is see if I can make this new trading style work where I use very tight stop losses and only small targets. If I could get my win ratio up with these tight risk levels then I could pass with surety. On the other hand, if I loosen my risk then I know my probability of passing will be higher but it also makes it more likely a few losing trades could cause me to lose. Perhaps, I should quit playing around and do what I need to do to pass. Frankly, I am more interested in the OneUp Trader account which is worth 5k. The TST account is only good for, I think, 2k. But, I would like to pass my first combine. If you start something: you need to finish. Yet, I am not sure it makes sense to pay double when I take the exact same trades in both accounts. Perhaps, I should try to trade, at least, slightly differently in one of the accounts, at least, to increase the learning value. As an aside, if you are trading on the simulator, instead of trading on a single simulated account: try trading on two or three, employing slightly different trade management techniques, thereby accelerating the learning process. Both accounts employ a trailing max drawdown which makes it more difficult to pass then it might seem like at first glance. However, there is no time limit. I have confidence I can hit these goals without a time limit: perhaps not on a first try but within a few months. However, I know a lot of traders have also thought they could and tried and failed. As such, I need to carefully weigh the money I am paying spending that I could be saving for my live account versus the rewards of passing. I do not think it makes sense to continue with both accounts concurrently unless I am willing to trade them in different ways. Because the OneUp Trader is the better deal, if I am not 50% or better toward the TST profit target by the end of this billing term then I will have to strongly evaluate whether or not it makes sense to continue and will consider closing the TST combine. As for my trading methodology, I am a tape reader. I read the markets using my AlphaReveal software and monitor additional proprietary graybox indicators and systems. The graybox signals do seem to be working well but require many times larger stop loss to be traded in a systematic fashion. In this new experimental “scalping” style, I am trying to keep my typical loss to 3 ticks or less. The super tight stop losses represent the big unknown for me. In the past, I have found that using larger stop losses works relatively well for choppy markets like the ES. Not typical or representative. No claims made. NinjaTrader performance report for the TST account without commissions. My short trades aren’t making money: however my short predictions have been super accurate. I need to get better entries on the shorts or widen the stops. 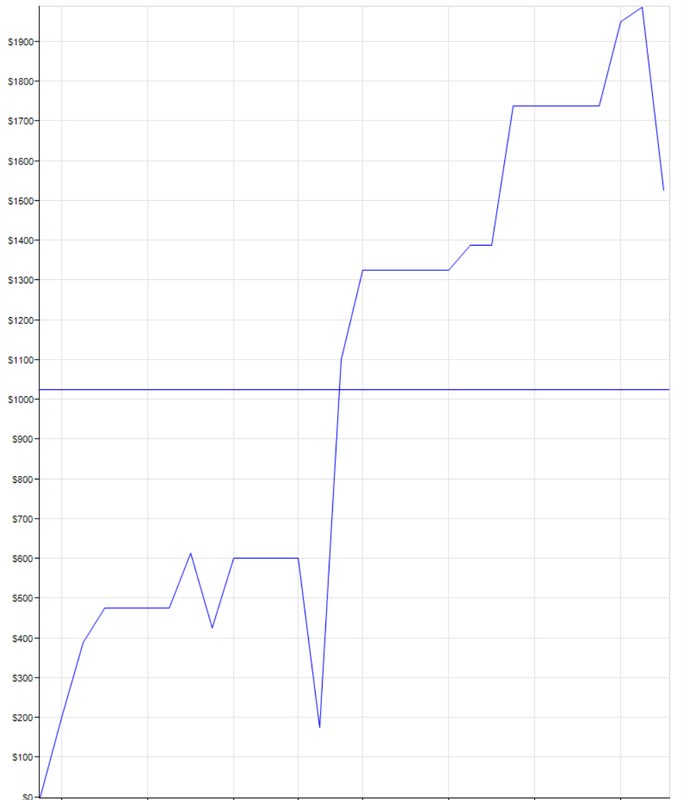 Below are the live account results over same the period. Fills are similar: suspect the difference in performance is due to only trading 1 contract in the live. This was pulled from Tradestation’s “Account Manager”. On a day to day basis, the results I see in this report match my live after cost results. However, I am not sure if these results truly include all the costs: if anyone knows then please comment below. Finally my OneUp Account, I have only been trading it for two days. I am trading it with more contracts because the risk limits are different. These stats may not be correct as they have had some issues with their cloud analytics. As for my systematic trading, below was one S&P 500 e-mini futures system I offered for subscription in 2011. It is no longer offered: but I will be looking at potential new systems to offer in the near future. It was around 80%-90% systematic with only minimal discretion. These results are after somewhat high commissions and fees and include a mix of live and simulated/hypothetical fills. Like many systematic systems, it wins consistently and has a much larger average profit per trade but is subject to taking the occasional large hits. I hit the trailing max loss on the TopStepTrader account. The loss came as a result of max sizing every trade. It started when I lost a few max sized trades, and I knew it would take longer to work off the losses dropping my contracts. This was the wrong thinking and led to a series of bad trades. However, that would not have been enough to end my good run. I, also, max sized every single trade and had some “good trades” go bad, as well. It is really difficult to grow a small account. In addition, given that it is only cost $100 to reload and time is money, I am not sure that treating it as a real account is the proper way. But, when you treat it as a game then you will have to reload. 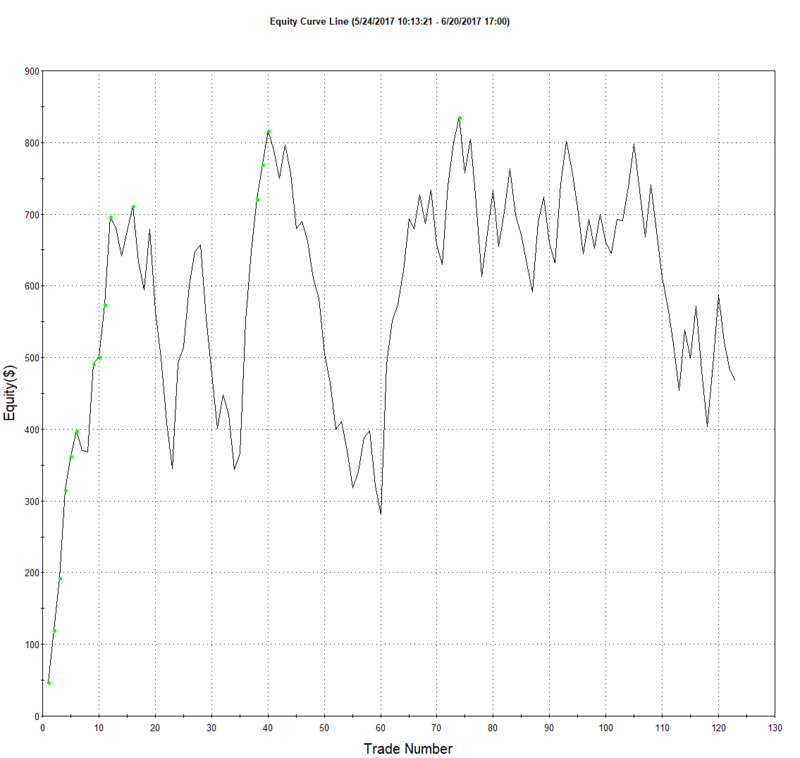 I feel like the main value for me in this experiment was being able to inflect on trading as a game versus as an exercise in risking real money. For the most part, I treated it like I would real money but seeing it as a game was illustrative, as well. Beyond that thinking about trading more contracts opens up a lot of possibilities. I am focused on the OneUp Trader and plan to continue with that and, if needed, reload until I have more information as to what is possible. I do not plan to reload the TopStepTrader because I do not like the idea of doing the “Funded Trader Prep”. While not an excuse, I feel like that was in the back of my mind and might have contributed to my loss. As I stated, I do think these ventures are more “shot taking” approaches where one needs to hit a good run to make it work. And once funded, I think a trader who wants to do this long term needs to take out and reserve the first 25k to 30k in profits for eventual drawdown and lower performance. That is my plan anyway. I think the key to trading for paramount returns is dynamic leverage: variably changing the contract size based on the changing moment to moment conditions and trade quality. (1) Scalping with a highly selective style for just $50 to $100 per day day on 1 lot. If a trader can make even say $50 per day trading 1 lot then it makes more sense that it should be easier to scale that to $500 per day trading 10 lots then it would be to try to capture that 10x as much market movement. Stopping, at least, in the live and going to sim or study makes sense too once a profit target is hit unless the conditions are exceptionally good. (2) Trading a shadow account with small size all the time to keep a good feel and then only moving to the live account (or the tryout account) when you have the highest confidence. (3) Selective trend trading. Trends that trade in tight rising channels offer potential for adding a ton of contracts. Most markets don’t trend often or cleanly enough for this approach but if a trader can learn to recognize these times and markets then there is potential for really outsize returns in short time. However, this is very difficult to do in practice because it is easy to swing to a loss with a small pullback and then the trend resume. (4) Stop management is paramount when trading multiple contracts. I will be exploring some cutting edge concepts that may help with that. This is surprisingly one of my most popular articles even though most of this blog is dedicated to system trading. As such, you may want to check out this more recent post. Great write up on TST. I am currently thinking of how to pass the TST myself with the $2K drawdown account. My goal is to develop a system in NinjaTrader with a drawdown of $2K and decent net profit returns and run it in TST. This will be challenging because the system will have to avoid drawdown 3 times. 1 for the combine phase, another for the FTP phase, and another for the funded stage. Since the $2K drawdown account has a profit target of $3K to move to the next phase, this means I need to hit that profit target 3 times. 1 for the combine phase, another for the FTP phase, and another for the funded stage. So the system to pass TST needs to have drawdown less then $2K for me to re enter the TST program. I am still searching. The question is can I produce a trading system with $2K drawdown and total net profit of $9K ($3K times 3 phases of the TST program). And this has been my challenge the past 4 months. The only way to know this is continue back testing trading ideas across different markets. I agree with you about the “shot taking” comment. I tried the TST for 5 months manually trading, I enjoyed the challenge although I hit drawdown 2 times and decided to step back and find a trading system to pass and get funded. These are just my thoughts. Do you have recommendations or opinions to my journey/challenge. Right, I would look at OneUp. I am doing a tryout with a new/another outfit. I’m not sure if it is in beta still or I’d mention it. But, as far as trading systems: the terms are too strict. I mean that, it would probably be easier to save and fund your own system @ 7k-8k. Right, if you want to pass you’re going to need to build a higher frequency system. You might get the drawdown, down, but then your return will go down too. You can run a monte-carlo analysis to see what the probability of your passing might be. What you might do is look at the average DD per month instead of the max. You can also count the # of months that you exceed or pass the DD out of all months to come up with a probability of blow out that doesn’t rely on the MAX DD — which will in most cases be too high. The problem is going to be hitting the profit target though. A “realistic” but good system would take 6 to 12 months to produce a 50% to 100% and would have DD around 30% to 50%. So, I think the only hope is that if you’re building higher frequency systems and you are simulating limit order fills. That’s your “ticket” if you’re building systems: it has to be an HFT system. Not many retailers have been able to build working limit order systems. If you can get close with market orders, you might try the tuning process in Ninjatrader, aka tuning the limit orders using their market replay. I guess the question, on my part, is you can get your DD down and you can build a working HFT system then why bother with funding from TST? Just fund yourself. For a discretionary trader, it is different because you always have to wonder: am I going to trade different with money on the line vs. in simulator. So you might think: give myself every edge possible. The firm I’m trying out for now, also, has a floor in NY which was a selling point and potential to collaborate with other traders. For trading systems, if you build it out properly and you paper trade it (in simulator) then you’ll have a pretty good idea what it will do. There is not as much psychology involved. It is just a matter of work to make sure you submit the orders and don’t miss trades. Also, most systematic traders aren’t trying to build HFT systems because it is not really required and those sorts of systems are more difficult to develop and test. But, if you can make it work: the big advantage is that you won’t need the larger stop losses and/or more frequent profits. NO YOU CAN’T!! IF YOU COULD, YOU WOULDN’T TST OR ONEUP… YOU CAN FUND YOURSELF, WITH THE MONEY YOU SAVE FROM COMBINE FEES. I’ve been working on both the TST and TSFX accounts. I’m almost at the $6.6k mark on step 1 in the FX account and on step 2 in the futures account. I made it through step 1 of the futures account in 5 days for the 100k account. Have either of you completed the combine? Only one of me. No I did not complete it. I am not certain I completely understand the “game” in TST. Correct me. 2 levels, eg, fund with 30k, and make a 2k profit without experiencing a 2k draw, if the draw, then I guess you start again. If you reach 2k target or more, repeat again trying to achieve 2k with no 2k draw. So in the end, what you are really trying to achieve is a >=$4k profit, with no more than a $1.9 drawdown, over any period or stretch to time. Am I right? @Ashley In general, I do not recommend these sorts of “try out” firms at this time. The funding level in relation to the cost is not a great value, and it is always a trivial amount. In addition, as for TST, the terms are always changing. Also, they use a trailing drawdown. The first time I failed my account was essentially at break even. I tried it because I had a discount. Also, I technically passed at another firm, not going to mention, but they failed me on what I felt was a technicality. I well exceeded the profit targets. There may be good firms out there: but, I have not seen any proof though. I think these firms owe a higher level of proof then vague innuendo. But, again the landscape is always changing and competition is good: so I am not conclusive that there are not opportunities. Instead, what I do recommend is for traders considering that route is to open an account at a discount futures broker, it doesn’t require much money, and setup your own test(s) to pass. Just do not trade in the live until you “earn” the right and even then be prepared for total account loss. Thank Curtis, what is a trailing drawdown, is that max retracement on an intraday basis from equity high? not at the close but within the day? Is it that hard to trade for a $4k profit with a 2k draw? @Ashley I do not remember all the terms but you could check to see what they are today. I believe it was $3,000 profit target, $2000 max trailing drawdown, and $1000 daily loss limit (at least on their site looks the same). I believe I came close to the target then had a drawdown to approximately break even. 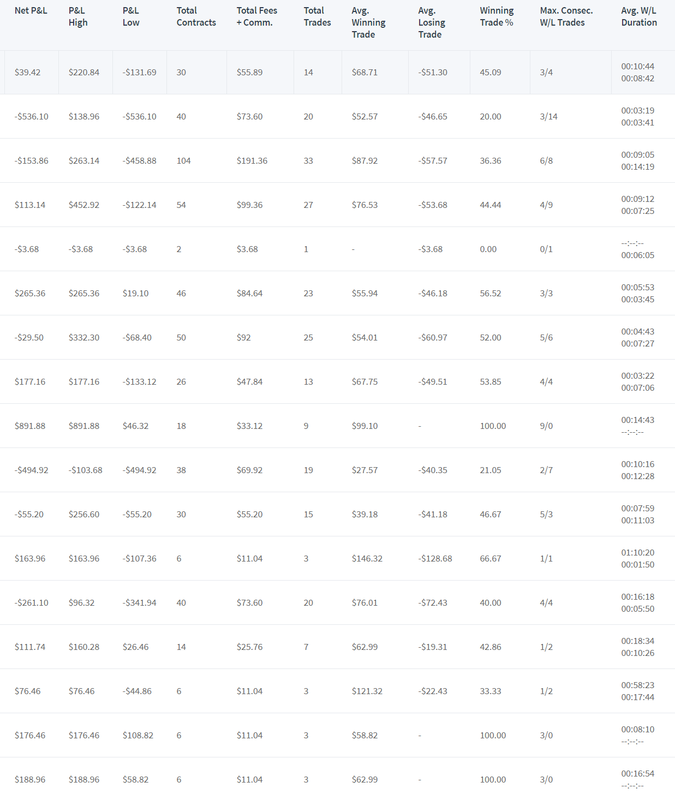 Well, if you can do hit these goals consistently and within reasonable time frame, say 30 days, you are basically able to make a living trading a $2000 account ($3000*12=$36,000). Bump that to $4,000 to make a very nice living even without scaling of $72000. Most professionals would recommend a minimum of around $25000 to even attempt to trade for a living. That is a minimum. Not a recommended level. So you are basically attempting to do something with 8% of the minimum required capital. Another way to think about it is that what is the maximum sensible to risk on your account per day? Let’s say that’s between 2% and 5% for discretionary traders (possibly a bit more for systems). But, let’s go with the 5% level, risking 5% of your account per day would imply an account level of $1,000/.05= $20,000. On the other hand your total allowed drawdown is $2,000 or 10% of that. In trading anything is possible, if a trader gets in the tune with the market well and the volatility is supporting then it is certainly possible to have a good “run”. On the other hand, what is possible to achieve consistently, dealing with the real-time changes in regime and volatility, is much less for most traders. @Ashley It is suspected most of the best prop firms will attempt to reverse engineer their traders strategies. But, in honesty I think most firms today are too lazy and would rather make money selling the dream. The reverse engineering bit requires, you know, actual work. Also, the track records are probably too short for meaningful ML reverse engineering. The motivation is simply enough traders will lose to fund the traders that succeed. That said, some firms may be looking for talent. It is really a no lose situation as the model funds them. If it takes a trader a few months to pass and a few resets, even the traders that get funded will probably have already funded themselves at close to 50%. Of course, you can also use the platform to sale more products. I do not want to come off too negative on the model, though. There may be windows of opportunity and with competition the model could improve. I will continue to monitor. CURTIS, RE THIS, WITHOUT COMMISSIONS, YOU’RE AVERAGE TRADE IS 6.43$, WITHOUT ZERO LATENCY, AND NO COMMISSIONS, AND SLIPPAGE, WHY DO YOU CONSIDER THIS ALGO ? 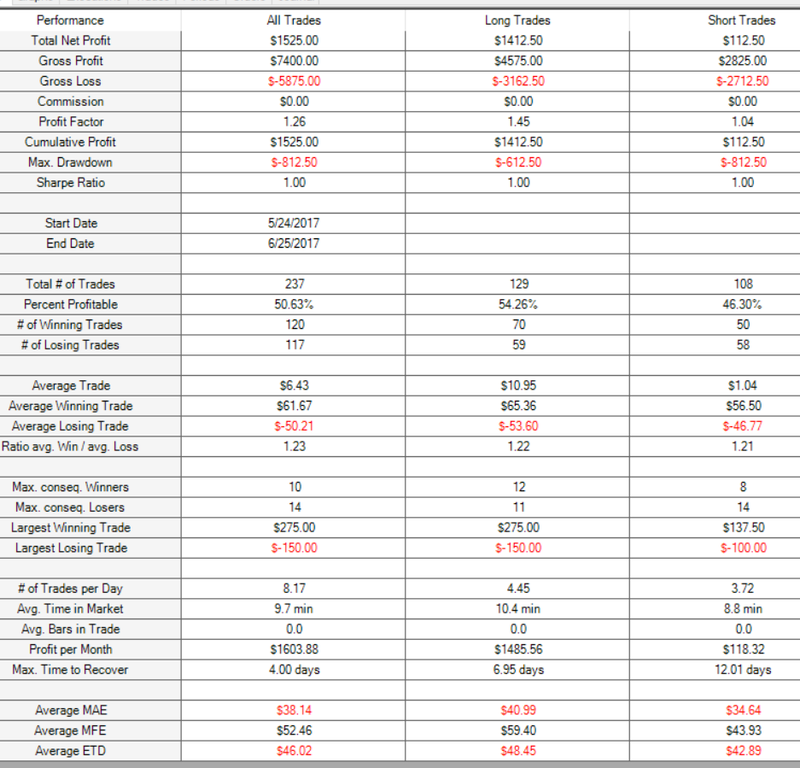 237 TRADES, $6.43 AVG TRADE.?? @Ashley Sorry I don’t know what you are asking. There is no algo. It was discretionary trading. These tryouts use Rithmic which has a very accurate limit/market order fill engine. It is not zero latency. I was trading these side-by-side in live Tradestation and the fills were very similar. If you are asking what is a good avg trade after before/costs? An excellent performance for a scalper would be profit factor > 1.6, avg trade > $13, win ratio >=55%, commission to gross profit < 35%. But these sorts of stats would always be changing. HERE’S THE UPSHOT… do you realize how many different approaches, tests, etc are used to try to determine the robustness of a system, and yet, even if the stat metrics on a system pass, the system invariably fails in walk forward or realtime. AND TST AND ONEUP ETC, JUST LOOK AT A MINIMUM OF 15 DAYS WITH 6000 PROFIT, AND 3000 DRAW…CMON!! DESIGN AN ALGO WITH HISTORICAL RESULTS GOING BACK 6 MOS, WITH THOSE STATS, NOW WALK BACKWARDS OR FORWARDS, THE SYSTEM WILL FAIL! gross loss should be 20% of gross profit then you can rely on the strategy .